Compare California Bay Area CSA and local produce delivery services hand selected from The Chic Ecologist editors. Having actually used these services ourselves, we have had great experiences with the following. Feel free to add your favorites in our comments so we can expand this list! Sourced from their own family farm, or partner farms within the Bay Area, this truly local Community Sourced Agriculture (CSA) program is based in Half Moon Bay. Each week (or every other week) you receive a box of pre-selected organic, local, in-season produce. Customer service is handled by the owners themselves, and their produce is locally seasonal and organic. A delivery service for local and organic produce, as well as many products and brands you may traditionally buy at Whole Foods or supermarket. You are able to select your items and have them delivered right to your door. A large selection of natural foods, most of them are locally sourced (within 500 miles) and organic. A fully certified organic CSA since 1985, Fully Belly Farms fresh produce comes from a 350-acre Capay Valley farm north of Sacramento, and deliver to a 120 mile radius. You can preview their produce and many of the local farmers markets around the bay, or check out their Hoes Down Festival to experience farm life. Growing 85% or more of their produce directly on their 105 acre farm, Eatwells is located just outside of Dixon. Sustainably grown produce by local, committed farmers provides each box with a variety of items. For those daunted, they also provide information on identifying items, when to cook (based on perishability) and how to store them for maximum freshness. A diverse item service, this delivery box can include honey, local bread, eggs, cheese, nuts, and juice along with local produce and herbs. 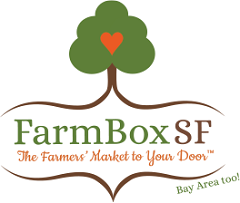 FarmBox also offers several customize boxes to include poultry, fish, or even gluten-free boxes, they are looking to replace your shopping altogether. Dozens of local sustainable farms all group together to provide the freshest produce for Farmbox. Delivering to many western states, Full Circle offers four different weekly box sizes to cater to your family size needs. You can also customize your box with alternative produce prior to delivery. Grocery options are available for a wider variety, and some produce may be sourced from greater distances than other options in this list. Basically, you may sacrifice locality for greater selection in some instances. Located and partnering with several farms in San Benito and Santa Cruz Counties, Eating with the Seasons offers 4 different sized CSA boxes for local pickup. Providing local produce with additional local products like pastured eggs, olive oil, granola, and preserves available as add-ons, you can customize your box prior to order on their website using a credit system. With options similar to a build-your-own-box, this is a great option for those who want to pick from local produce availability. If you like lots of options and add-ons, you will love Albert and Eves. You can select a base box size based on your fruit to veggie ratio to start, then go from there. Increase the box size for more family members, or add from an exhaustive list of cheese, nuts, pasta, eggs, dips, beverages, and more to be delivered along with your box. They are also partnered with ALBA (Agricultural Land Based Association), a small-farm business incubator helping farm workers and other low-income individuals to create their own farm businesses. I’m trying to find a CSA box place that delivers to Watsonville! Any suggestions? I would hope so since so many CSA farms originate out that way! I did a quick search and found a few, however, I have not used them. I’d be happy if you tried one and came back to give a review so I could include it here.